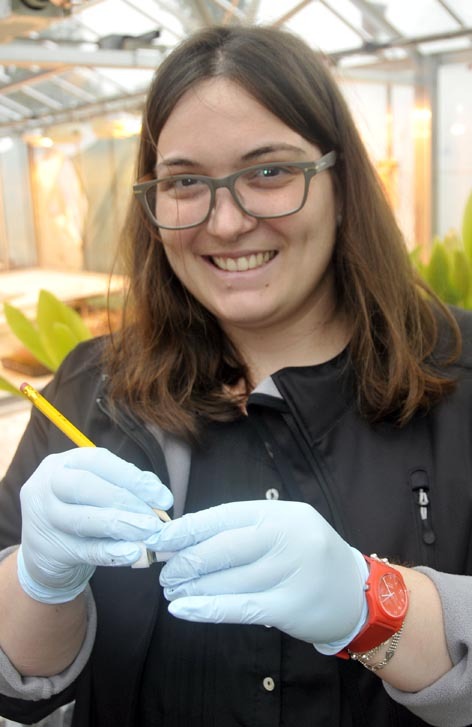 Natália Melloni from UNESP and IAC, Brazil, has been characterizing Saccharum sugar cane hybrids in a collaboration with the molecular cytogenetics group. The title of the project is “Characterization of interspecific hybrids (Saccharum spp x Saccharum spontaneum) by molecular cytogenetics” or “Caracterização de híbridos interespecíficos (Saccharum spp x Saccharum spontaneum ) por citogenética molecular”, and involves several collaborators from the Faculdade de Ciências Agrárias e Veterinárias, UNESP, Jaboticabal, Sao Paulo and Centro Avançado da Pesquisa Tecnológica do Agronegócio de Cana, IAC/Apta, Ribeirão Preto, SP, Brazil as well as MNG (Natalia) Melloni: Melloni, MLG; Rossini, L; Creste, S; Xavier, MA; Landell, MGA. Natalia first tested the technique on normal sugarcane (Saccharum officinarum) from our Botanic Garden and then analysed 5 of her hybrids (Saccharum ssp. x S. spontaenum), clone 221, clone 292, clone 297, clone 303 and clone 316. She was able to differentiate the chromosomes originating from either parent by genomic FISH and could show that both contribute to the hybrid in the predicted proportions. Natalia has obtained a good number of very good images of the chromosomes of Sacharrum that will be able to be published. However, sugarcane chromosomes are extremely small and plentiful (2n=120-130) and therefore detailed cytogenetic analysis and estimation of any recombinant chromosomes is not possible with the genomic probes. Further the hybrids analysed are F1 hybrids and have not gone through meiosis yet and no recombination was expected. However it is important to establish the true hybrid nature of her plants before directed crossing experiments. We discussed possible bioinformatic approaches which may make probes with enhanced genome-specificity as genomic DNA sequences may become available. ¹ Faculdade de Ciências Agrárias e Veterinárias, UNESP, Jaboticabal, SP. ² Centro Avançado da Pesquisa Tecnológica do Agronegócio de Cana, IAC/Apta, Ribeirão Preto, SP. Sugarcane is an important crop worldwide due to sugar, ethanol and more recently biomass production. Modern sugarcane varieties, Saccharum spp are vigorous hybrids originating mainly from interspecific crosses between S. officinarum (a high sugar content species) and S. spontaneum (low sugar content and high fiber) followed by several backcrosses to S. officinarum to recover sucrose content. During backcrossing, the sugarcane varieties have lost important features related to high biomass and fiber production. Introgression programs focused on biomass and fibre have used crosses between sugarcane commercial varieties and S. spontaneum accessions. The present work aimed to better understand the processes of n+n or 2n+n transmission in a group of individual “hybrids” derived from a cross between the commercial cultivar RB855465 (2n=100-130) and S. spontaneum (GlagaH; 2n=112) and to investigate the contribution of S. spontaneum in the genome of these hybrids using genomic in situ hybridization (GISH) to chromosome preparations. After the confirmation of the hybrid nature by molecular markers (microsatellites), roots collected from germinated buds (BOD at 35ºC) were immersed for 4 hours in 0.04% 8-hydroxyquinoline before fixation. Total genomic DNA was extracted from S. officinarum leaves (Green German) and S. spontaneum (GlagaH) and labelled for GISH. The chromosome number was 2n= 100-118, confirming the haploid nature of gametes and the n+n transmission of parents. The genomic DNA probes labelled all the chromosomes and gave weak discrimination of two sets of chromosomes. The S. spontaneum probe labelled the centromeric regions most strongly, while the S. officinarum probe was more dispersed along the length of the chromosomes. In the accessions, about 60% of chromosomes labelled with the S. spontaneum probe and 40% with S. officinarum, supporting the hybrid nature of the S. officinarum parent; no recombinant chromosomes were detected. Given the differential labelling patterns, the method is likely to be valuable for defining the chromosome complement of sugar cane hybrids and derivative lines. More genome-specific probes may be developed with whole genome sequence information for use in identifying chromosomes in hybrids and helping target development of new lines. This entry was posted in Collaborators, Conferences, News, People, Research. Bookmark the permalink.